Although most surveyed moms who own e-readers are happy with their devices, moms who use social media are far more likely than non-social moms to share information about their e-reader brand with friends and family and pay a higher price for their device, according to a survey from Motista. Performance: Social media moms give their e-reader a 71.4% score (out of 80%) for "performing as promised," compared with 68.4% for non-social moms. Satisfaction: Social media moms rate their e-reader a 75.5% for overall satisfaction, compared with 78.5% for non-social moms. 67.7% of social media moms have forwarded information about their e-readers to friends and family, compared with 33.2% of non-social moms. 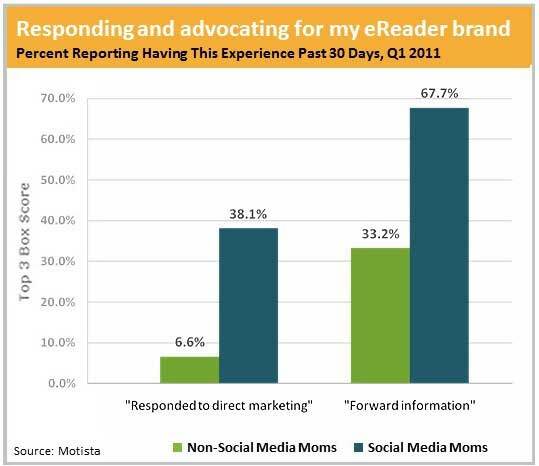 38.1% of social media moms say they have responded to a direct marketing promotion from their e-reader brand, compared with 6.6% of on non-social moms.